COTONOU, Benin, Feb 17 2016 (IPS) - Africa is eating more rice than other food staples, though it produces less than it needs. This is good news for the cereal’s potential to help Sub Saharan Africa out of poverty according to researchers. Rice is the second most important source of calories in Sub-Saharan Africa, according to the Africa Rice Center (AfricaRice), a research organisation working to contribute to poverty alleviation and food security. Thanks to fast urbanising Africa, consumption of rice is growing by six per cent annually. “Rice is important for Africa food security and the reasons are clear,” AfricaRice Center, Deputy Director General, Marco Wopereis, told IPS, adding that “consumers like it and the consumption growth is just mind boggling as a result of population and change of preference as people in cities want food that can be prepared quickly and stored easily and rice is just perfect for that.” Projections are that in 25 years, the world will be eating 110 million tonnes more of milled rice and one third of that will be eaten in Africa, according to him. Grown in 40 out of 54 countries in Africa, rice is the most important agricultural activity and source of income for more than 35 million smallholder rice farmers. However, current demand for rice is outpacing local production which covers only 60 per cent of requirements. As a result, the continent is spending more than US$5 billion annually on importing 12.5 million tonnes of rice each year. This accounts for 32 per cent of the world’s rice imports, making Africa one of the largest rice importers in the world and a major player in the rice trade. This situation is changing, says Wopereis, who is convinced that the rice sector represents a route out of poverty for Africa. Under its 2011-2020 Strategic Plan, AfricaRice has prioritised improving yields and the quality of rice in Africa. “We have seen after 2008 a tremendous increase in production and good news came out of Africa we have seen yields gone up by 30 per cent reaching 2,1 tonnes on average per hectare in 2012,” he said, noting that since then yields have remained flat but production has increased in area. “We would need a clear investment from public and private sector sectors to boost the rice sector with enabling policies to make it work because we are currently importing more than 12 million tonnes of milled rice and if we do not increase production, we have to import more and more and we could run into the same crisis as we had in 2008,” he emphasised. The 2008 food crisis jolted some countries in Sub Saharan Africa, forcing governments, international agencies and donors to invest in ambitious production programmes which have yielded results. More than 200 participants comprising researchers, private sector partners especially seed partners and government representatives from over 20 African countries, Europe and Asia met in Cotonou in mid-February under the banner of the AfricaRice 2016 Science Week and Global Rice Science Partnership (GRiSP) to take stock of developments in the rice sector in 2015. The Science Week served specifically as an annual review for reflection and planning of rice research-for-development (R4D) activities in 2016 for AfricaRice Centre and its partners around the world. There is good news on rice research. Indigenous rice varieties have received a facelift by helping develop resilient and high yielding lines of the cereal. Cultivated for more than 3,000 years in parts of Africa, the African rice, known by its scientific name, Oryza glaberrima, is unique to the continent and has become an economic and political crop. Over the last six years, AfricaRice has worked with policy makers to implement the rice strategy at the country level. For example, Senegal, one of the top rice growers in Africa, has identified regions that will be rice self-sufficient and produce for the market. Sustainably enhancing the production, processing and marketing of rice are some of the critical challenges that need to be overcome to transform the cereal into Africa’s key to food and economic security. 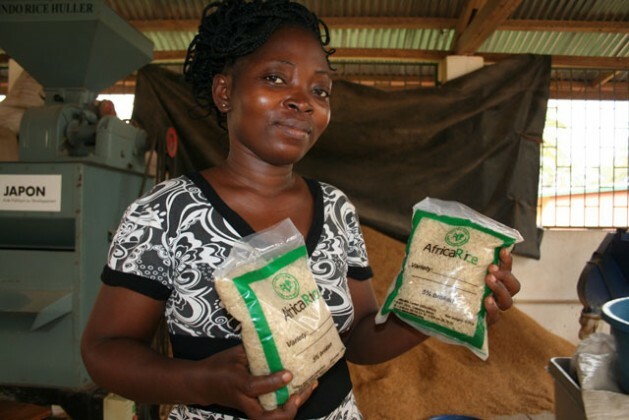 Africa has the technologies continues to improve them but the continent should link up with the big players such as Africa Development Bank through its projects and with the private sector to scale up rice technologies. Rice production per hectare should go up with improved seed varieties, efficient weeders, threshers and mini combine harvesters. AfricaRice is currently undertaking a study on what it means for Sub Saharan Africa to be self-sufficient by 2025. An estimated $20 billion would be needed in investments to reach self-sufficiency in 10 years. This will be reached through improved management of existing rice land, closing yield gaps and increasing production and where possible double cropping. AfricaRice three years ago developed seven high performing rice varieties known as the Advanced Rice Varieties for Africa (ARICAs) which has been developed with traits for tolerance to flooding at a vegetative stage, salinity, iron toxicity and cold. These are high performing compared to the New Rice for Africa (NERICA) varieties developed for rain-fed environments in the 1990s. Moussa Sie, a senior breeder at AfricaRice and coordinator of the Rice Breeding Task Force in Africa, said ARICAs will help increase the number of rice varieties available and boost production by at least 40 per cent. These have been developed using participatory variety selection tools that breeders use to involve farmers in developing what is suitable for their needs and conditions in the view of flooding and droughts as a result of climate change. According to Realising Africa’s Rice Promise – the most comprehensive reference publication on rice research in Africa – this staple is the future for Africa. The study, a global collaboration by 100 authors with considerable expertise, says sustainably increasing rice production and productivity, enhancing quality and marketing are key to the transformation of the rice sector. “Rice is critical for food security and political stability throughout Africa and it has the greatest potential to fuel economic growth,” the study notes.